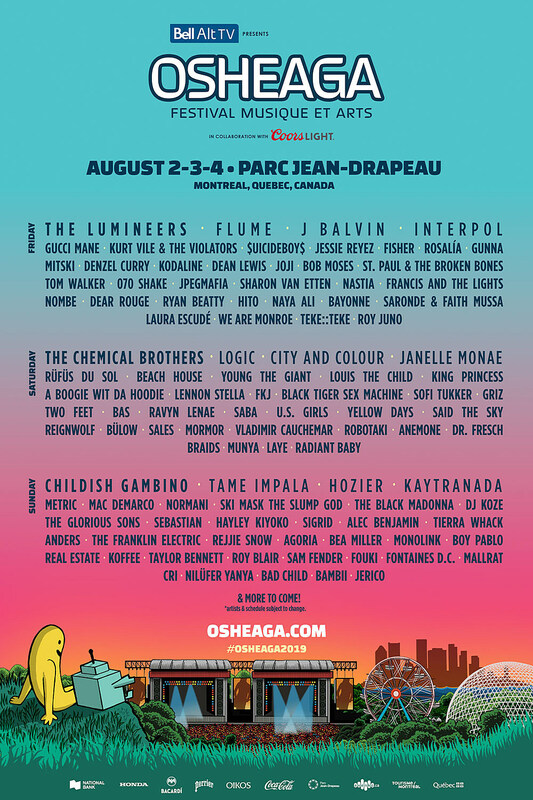 The 2019 edition of Montreal’s Osheaga Festival happens August 2-4 in Parc Jean-Drapeau. Headliners this year are The Chemical Brothers, Childish Gambino and The Lumineers, with Tame Impala, Logic, Janelle Monae, J Balvin, Flume, Kaytranada, Hozier and City and Colour following after that, plus Kurt Vile, Beach House, Metric, Mac DeMarco, Rosalia, Mitski, Denzel Curry, A Boogie Wit Da Hoodie, DJ Koze, Tierra whack, U.S. Girls, JPEGMAFIA, Sharon Van Etten, Real Estate, Fontaines DC, Nilüfer Yanya, and more. Full lineup is in the poster above. Passes to Osheaga 2019 are on sale now.